I admit, I like The Complete Idiot’s Guides. They offer a lot of good advice packed into one no nonsense book of information. The Complete Idiot’s Guide to Green Cleaning Second Editionby Mary Findley and Linda Formichelli is a newly updated version of the original Green Cleaning guide and is packed full of advice on how to clean anything and everything green. Mary Findley is a cleaning guru, she is the woman behind Mary Moppins and Linda Formichelli is best known to writers as one half of The Renegade Writer duo. They’ve created a classic must have for anyone interested in cleaning green. I’ve been cleaning green for awhile now, but I’m no expert. I usually purchase products from companies like Bi-O-Kleen and Seventh Generation. Sure I’ve been known to use vinegar and baking soda but I didn’t know they could be used for so many things. In this book you’ll find DIY recipes and ideas so you don’t have to go shopping for products, you can make your own. For instance did you know vinegar can prevent and get rid of mold? I had no idea. You can use distilled white vinegar to prevent mold and a mixture of borax and white vinegar to prevent mold from growing. That I have got to try along the edges of my bathtub, I am sick of scrubbing everything to death. If you want to know how to get out just about any stain on any surface you have got to check out Appendix A – Your Complete Stain Removal Guide. I wish I would have had this when my own green carpet cleaning business was going strong. 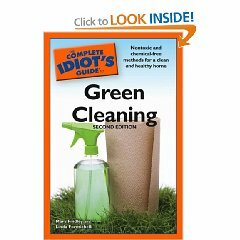 In The Complete Idiot’s Guide to Green Cleaning you’ll even learn how to clean your car and your pets greenly. I love the turtle advice, I didn’t know they were so messy, which is something good to know in case I ever do get a turtle or two. You’ll also get room by room advice on how best to clean green. A very interesting tidbit I discovered in this book is about flooring. I’ve read a lot of advice about getting green floors but I have never read the real deal and downfalls of some green flooring options. For instance cork and bamboo may be eco-friendly materials but not good for high traffic areas with kids and/or pets because they will easily dent and scratch. Also bamboo floors should not get wet-ever. They should only be spot cleaned because moisture can cause them to warp. And bamboo and cork will fade in sunlight. Huh? Good to know stuff. Believe me there are plenty of other interesting facts and cleaning how to’s in this book that your average everyday person probably wouldn’t know, I bet there’s a lot of green cleaning info seasoned greenies might not even know. I think this is a great cleaning book for green beginners and greenies alike especially for green moms (and dads) that want a clean home…not a toxic home.